Can I bring any bird to CFRC that I find injured or hurt? CFRC is federally and state permitted to rehabilitate Raptors and Eagles only. So if it is a waterfowl, songbird, shorebird, or other type of wild bird, we do not except it. However, please call us and we will try to put you in touch with some of the other local rehabilitators that are permitted for these birds. You can also go to the Wildlife Rehabilitators of NC website and check out a member in your area. Do I have to give a donation to bring a bird to CFRC? Absolutely not! But we would absolutely love it if you could. We take any injured or sick raptor regardless of any donations given by the person who gives us the bird. We thank you for doing the right thing and finding us! However, we NEED DONATIONS to keep the organization running... so if you can't donate, maybe volunteer, spread the word, give a shout out to us on your Facebook page...all this helps bring more attention and hopefully donations to the awesome raptors we care for! Is there a fee for coming to our school or event? 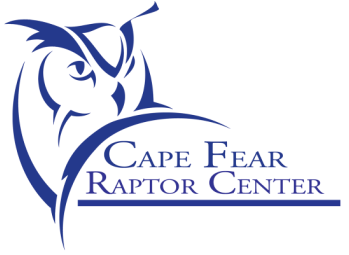 Cape Fear Raptor Center graciously asks that you make a donation to help us continue our work serving the Raptors of Southeastern North Carolina. Being able to educate young and old about the amazing birds and how very important they are in our ecosystem is the heart of CFRC. So don't hesitate to request a visit, we will do our best! Visit CFRC's "Educate" page for more information. For financial assistance, please see our "Admission for All" page. Are CFRC's education birds a pet? While it's hard to believe that these amazing birds that share their lives with us are wild, they are indeed! They are not pets... we are just priviledged to be borrowing them from their world. The education birds still have powerful feet and talons, and strong beaks. Fast movements or loud noises may scare them. We never underestimate them or take them for granted. We are here to protect them. Since our education birds are deemed unreleasable for various reasons, CFRC has Federal Education Permits that authorize us to care for them for life.